Home / Electricity: How does it work? Electricity: How does it work? As electricity cannot be seen, smelled or heard (when all is well), it is a technology that can be more difficult to grasp. Nevertheless, over the past century we have come to increasingly rely on electrical energy. It only takes a power cut for us to all realise how much we depend on electricity for our luxury, safety and comfort. The luxury, safety and comfort we take for granted at home and at work is also appreciated onboard a yacht or in a camper. The same goes when working in locations with no connection to a power plant, including on tugboats, Rhine barges or during road works. For more than 25 years, Mastervolt has specialised in supplying reliable electrical power in places without utility facilities. To offer a better understanding of our products, let us first give a short explanation of the main terms. The main activity of Mastervolt is power conversion. And the main variable that can be converted in the field of electricity is voltage. The electrical voltage is the potential difference between two points in an electrical circuit. We distinguish two types of voltage: Alternating Current (AC) and Direct Current (DC). Voltage is expressed in volt (V), and AC frequency is expressed as hertz (Hz), the rate at which voltage alternates. Alternating Current k(voltage) is the electricity that comes out of home sockets and is used for most appliances. In Europe this is 230 V 50 Hz, in the USA 120 V or 240 V 60 Hz. Direct Current is supplied by a battery or solar panels. Batteries are vital because they offer a practical possibility to store electrical energy. Battery voltages are commonly 12 V or 24 V. Another possibility is 48 V, which is usually exclusive to electric propulsion. While direct current is stored in batteries, we actually need alternating current to power our household appliances. This requires conversion from DC voltage to AC voltage. Another term we use is current (I), measured in amps (A). Current ‘flows’ through the onboard wiring when there are electric appliances in use. The amount of current that flows through the wiring can vary greatly (depending on the connected load and used voltage). This is why the correct cable thickness is so important – overheating electric wires can have serious consequences. A running river, a wire that conducts electrical current, or a cyclist biking against the wind… All experience resistance. In the field of electricity, this resistance (R) is indicated in ohm (Ω). Resistance is important because it causes losses in the form of heat, and we need to take this into account. Voltage loss takes place in wires and, if it is not dealt with, there will be insufficient voltage at the end of the wire to power the appliance we want to use. The mentioned variables all provide power (P), which is expressed in watt (W). Every electric device refers to its output in watt; microwaves of 900 W, light bulbs of 60 W, generators of 4000 W and washing machines of 2500 W.
To keep the terminology and discussion simple, we refer to kilowatts (kW), in which 1000 W equals 1 kW. To link consumption to a consumption period, we use a time unit in which electrical power is generated or consumed, namely one hour. Together they make kilowatt hours (kWh). The relationship between these units is expressed in formulas that represent the ‘laws’ of electricity. Having the right wiring is crucial for safety and efficiency. Incorrect diameters can lead to overheated cables and cause a fire. This is not just theory; vessels and RV’s are lost every year due to onboard fires that are often caused by faulty wiring. As well as being safer, a proper cable thickness also ensures that your battery charger and inverter perform to their best. Using thinner cables than recommended between the battery charger and inverter and battery (set) could lead to excess voltage loss through the cables, resulting in an excessively low charge voltage on the battery terminals. This in turn means the batteries are insufficiently charged, which has a negative impact on their lifespan. Using thinner cables than recommended for the inverter will prevent you from using the maximum capacity of the batteries. In this case the high (cable) losses cause the DC input voltage of the inverter to be (much) lower than the actual battery voltage, which makes the inverter switch off too soon and not use the full battery capacity. This is why people often use thicker cables than required. 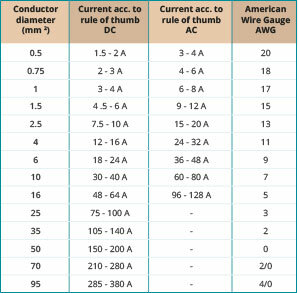 As lower voltages also involve higher currents, it is even more important to use the correct cable thickness. The current (A) is higher because direct current with 12 V or 24 V is lower than alternating current with 230 V while the (required) power stays the same. As a result the current will increase as P = V x I. For 12 or 24 V DC systems, 3 amps power per 1 mm² cable diameter applies. For 230/120 V AC systems, 6 amps power per 1 mm² cable diameter applies. Example: If a battery or battery charger provides an expected current of 75 amps, you require a cable of at least 25 mm². With an onboard petrol or diesel generator (usually AC, also available in DC). By the alternator(s) on the main engine. Wind generator (AC or DC). Generated energy can be used immediately or stored in the batteries using a battery charger. A battery charger converts the AC voltage into DC voltage. An inverter usually converts a low DC voltage of 12/24 volt into an AC voltage of 230/120 volt, 50 or 60 Hz. You may also encounter DC-DC converters; these devices convert DC voltage into another DC voltage, for instance 24 V from a battery to 12 V to power your navigation equipment. Designing a complete electrical system requires detailed knowledge, experience and information (the subject has filled entire encyclopaedias!). The specialised Mastervolt dealers are at your disposal.